Blood Brothers the musical has been and continues to be extremely successful, as it has played continuously to London audiences since 1988 and has become the longest-running show ever at the Phoenix Theatre, its current home. The show has seen a host of celebrities take to the stage in leading roles, and the soundtrack which was released in 1995 by the current cast at the time, has become popular amongst fans of the musical. The music was in fact composed by playwright Willy Russell, who also wrote the story of Blood Brothers, as well as other plays including Educating Rita and Shirley Valentine. The cast recording included Stephanie Lawrence as Mrs. Johnstone and Paul Crosby and Mark Hutchinson as brothers Mickey and Eddie. 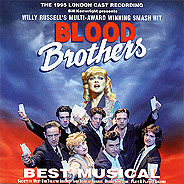 The 1995 recording to Blood Brothers the musical is the only official soundtrack available, and it is available to buy online, or at the merchandise stands at the Phoenix Theatre.